FOMC: Is Tapering Really Coming? After many weeks of uncertainty, Big Ben finally set the record straight and announced what the Fed plans to do with its bond purchase program. Aside from keeping interest rates and the monthly pace of bond purchases unchanged for the meantime, the Fed caused quite a ruckus in the markets by saying that a reduction in bond purchases could take place as early as the last quarter of this year. According to Bernanke, the U.S. central bank might start tapering down its stimulus efforts towards the end of the year or by early 2014 if economic data eventually comes in line with the Fed’s projections. For now, the Fed expects joblessness to fall to 6.5% and GDP growth to range from 3% to 3.5% next year. Although the statement initially triggered a massive Greenback rally and appears long-term dollar-bullish, there are actually two sides to the story. On one hand, the recent FOMC announcement shows that the Fed is committed to take action. This has been positive for the dollar, as it reveals that the Fed is watching the economy very closely and is ready to adjust monetary policy appropriately. On the other hand, the statement also reflects that the Fed is also willing to increase purchases if economic performance is weak enough to warrant more stimulus. “If the economy does not improve along the lines that we expect, we will provide additional support,” Bernanke cautioned. 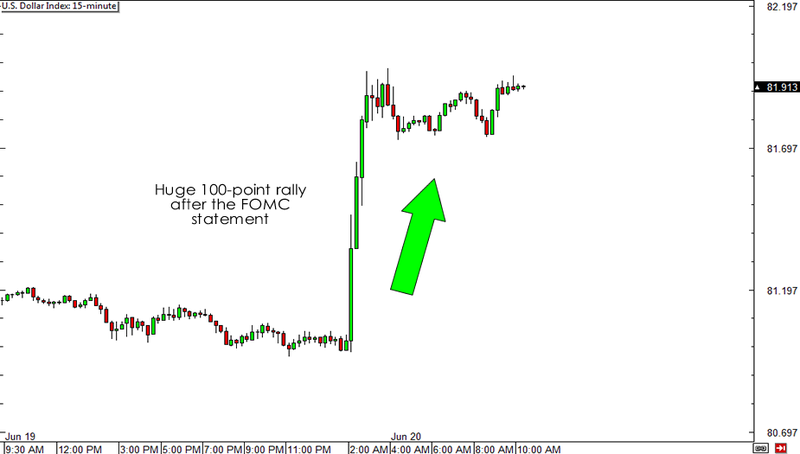 Immediately after Bernanke’s statement, the Greenback soared across the board. In particular, the U.S. dollar index that tracks the performance of the currency versus other majors jumped almost 100 percentage points from 81.00 to 82.00. Meanwhile, in other financial markets, the S&P 500 tanked 1.4% to 1,628.93 and the yield on the 10-year Treasury note rose a whopping 2.39%. The prospect of an end to the Fed’s asset purchase program that has supported the economy in the past several months triggered a major case of risk aversion. If the Fed terminates its quantitative easing program too early, the U.S. economy could just end up where it had been a few years ago–a country with a frail economy, weak growth, and high unemployment. It seems like the Fed has a tough couple of months ahead of it in terms of managing expectations. Market participants priced in tapering as something inevitable but data showing that the economy has truly improved and will meet the Fed’s projections has yet to actually come out. For now, it might be premature to make any definite conclusions as to what the Fed will do from a couple of weeks’ worth of data. Do you think the Fed will actually taper before the end of the year?